In this age of instant gratification, it’s so refreshing when a writer actually does his (or her) homework before sitting down to write any kind of significant work. Many biographers—especially in the music world—simply gather together already published snippets, never speaking to their subjects to get a first-person perspective on the chronicled events. In working on his latest book, Light and Shade: Conversations with Jimmy Page, author Brad Tolinski not only managed to have a passing discussion with one of the most press-averse musicians, but over the course of almost 20 years, he was able to develop a professional relationship with Page, resulting in deeper insights into the artist’s music and life. It is obvious from his writing that the author is a fan of the guitarist, but he manages to temper that nicely in order to tell a reputable and interesting story. Jimmy Page, founder and lead guitar player for Led Zeppelin, grew up right in the middle of England’s blues epicenter, nicknamed the “Surrey Delta” because of the heavy influence from the Mississippi Delta blues artists. He was in good company: guitar royalty, Jeff Beck and Eric Clapton, were his neighbors. Not to be outdone, Page developed his own virtuosic guitar style and sound. 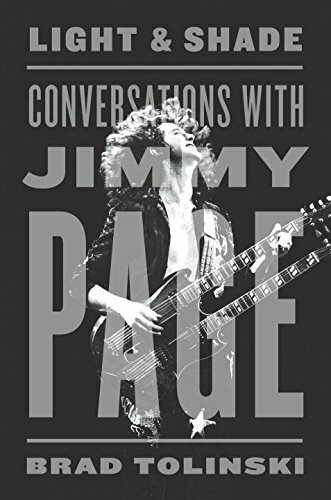 Throughout his storied career, Page was notoriously (and understandably) reticent with the press, which makes this book even more significant because the reader gets to meet Jimmy Page (again) for the first time. Mr. Tolinski’s book is set up in an easy to read fashion. First, he gives the reader a little bit of history about whatever topic he wants to cover: Page’s days with The Yardbirds, the years developing his talents as a studio musician, or his life getting the Led out. After each of these short chapters, the author then adds a relevant portion of an interview: either with Page himself or with former bandmates like Jeff Beck or John Paul Jones. These third-party interviews really give the book some gravitas and move it out of Jimmy Page Fan Boy-dom into true biography. Reading Light and Shade: Conversations with Jimmy Page is almost as fun as listening to “Whole Lotta Love” or “Kashmir.” There might not be 20-minute solos in Mr. Tolinski’s book, but we still get cameo appearances from some great rock legends, not to mention a highly engrossing story. Light and Shade is simply an excellent rock ’n’ roll read.